When I first began reading Zendar: A Tale of Blood and Sand, my thought was “I’m going to really like this story.” Thankfully, I wasn’t at all disappointed. It had everything an avid reader wants: passion, hatred, love, magic, mystery. The heroine of Zendar, Azel of a dying Bloodline, is strong-willed, pure and witty. She is a young woman who is already promised by her family to marry another. On her way across Zendar, her ship is attacked, and she comes face-to-face with Aleron, a ruthless leader who seeks revenge for the mistreatment of his ancestors, and wants nothing more but to rule every bit of Zendar. Aleron could have any woman he wants, but when Azel resists him, enticement toward her rises high within him. Zendar starts off slowly, telling the much need to know history of Zendar and the Bloodlines. Once the world-building and the background are completed, we start the ground running with the present life of Azel, who is preparing to leave the only home she’d ever known to meet the future husband she’d never met. The characters, from the walk-ons to the major were very believable, and you can’t help but want to know them more. Azel has a rare power which is powerful, but also has a major weakness. Along the line, she finds herself struggling against the duty to her family and the desires of her heart. We see Aleron as a leader, who is but a child that wants what he wants and usually gets his way. 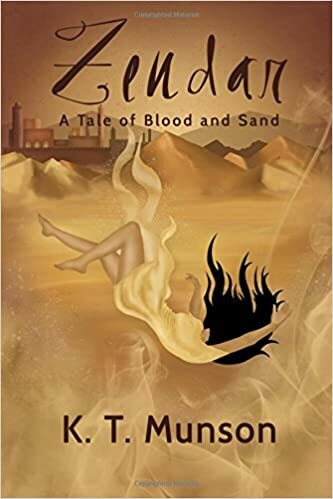 Zendar: A Tale of Blood and Sand is a tightly written adventure, fast-paced, and I had to finish the novel in one sitting. There is nothing better than reading a book, which the images are so vivid, it’s as though you’re watching a movie. It is a novel that I may one day reread, and I hope that one day soon, a series will be in the works so that we may once again delve into the lives of Azel, Aleron, and their descendants. The story line sounds familiar added to which I was brought up in a society where arranged marriages where the accepted ‘norm’. Nevertheless, your review implies some god writing and consequently this book sounds to be an interesting read.